You guessed it, another long-time favorite caught my attention while perusing my library. “The Story of Silk” literally jumped off the shelf into my open hands. I continues to be a fascinating read covering the complete history of sericulture from its origin in China over 5,000 years ago to where the industry stands today. The indepth text is strongly supported by a range of pen and ink illustrations as well as a selection of historical black and white and color photographs. Don’t expect the glossy magazine type book we are so familiar with today. This volume is modeled after the University textbook we recall from 20 to 30 years ago. I was a spinner in my previous life and when studying various fibers and the way to process them, while completing the Master Spinner Programme at Old College during Fiber Week, I picked up this well researched source book. We have moved a couple of times over the years and I always cull my library – books are heavy and take up more space than we realize, not to mention the weight when moving boxes. This book has never been on the discard pile. I reach for it more often than I expected. It contains solid information and is a constant reference whenever I research and work with silk in all its preparations. Back to reading… can’t put this one down! 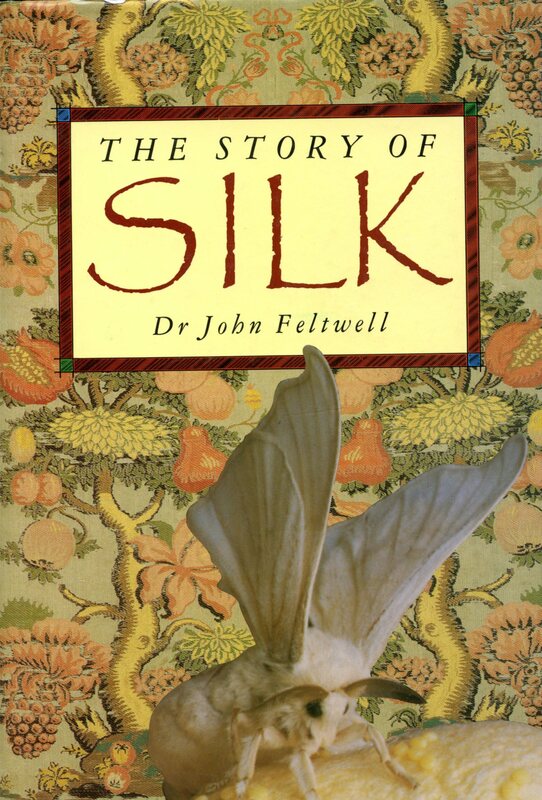 Here is a link to Dr. John Feltwell’s website where you can find out more about “The Story of Silk” and other books he has published. 21 May	This entry was published on May 21, 2015 at 6:03 am. It’s filed under Art, Book Review, Creativity Update, Design, History, Journaling, Networking, Product review, Special Project, staying in touch and tagged book reveiw, China, France, history of silk, Huguenots, Master Spinner Course, Olds College - AB Fibre Week, research, seri culture, silk weaving, The Story of Silk by Dr. John Feltwell. Bookmark the permalink. Follow any comments here with the RSS feed for this post. Glad you found the book interesting. John, your book is one of the most informative books on the subject. Thank you for commenting today! Thanks for this Anna. It looks fascinating. I can honestly day that I have read this book several times and every time I pick it up something new and exciting jumps from its pages. Check out the library – it should be available through inter library loan. These examinations of crucial elements shaping human history always fascinate me. So add this to those volumes on salt, cod, bees, cotton, salmon, perfume, and more. And thanks! Thanks, Jnana – the cultivation of silk trade and its trade definitely shaped crucial elements of human history . I always appreciate your personal insights.